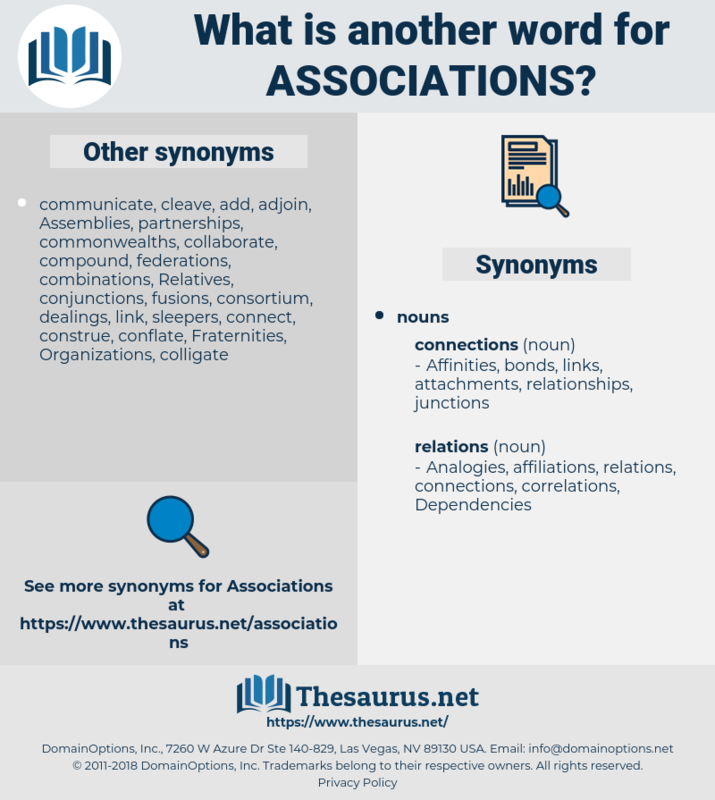 What is another word for Associations? organization, Organizations, organisation, organisations, union, unions. coalitions, relationships, organization, Organizations, organisations, unions. Institutes, leagues, federations, Societies, syndicates. federation, federations, Societies, confederation, institute, society, syndicates. confederations, consortiums, cooperatives, guilds, leagues, gangs, federation, federations, Societies, syndicates. 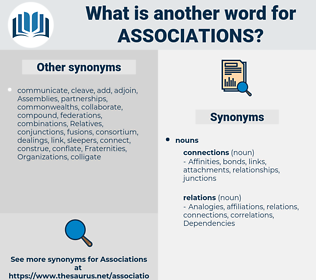 connections, Companies, representatives, EAS, Firms, Studies, bonds, Charities, IFS, organs, organisms, Ideas, ties, combinations, corporations, Foundations. concentration, organised, Organizing, appreciation, so, professional, Charities, IFS, advisory, regional, authorities, institutional, organize, organs, institution-building, organic, SCO, des, system, organisms, pollutants, Ideas, FATF, romania, moroccan, moroccans, ties, assocation, red, plan, major, parent, romanian, verenigingen, equal, state, bundling, man, Les, morocco, Forms, Associating, ASSN, combination, combinations, corporations, foundation, Foundations. connotations, interconnections, connections, factions, committees, cooperation, co-operatives, agreements, associates, Concentrations, administrations, alliances, collections, instructions, Companies, interrelationships, installations, consolidations, jurisdictions, contacts, contracts, transactions, habitations, affiliations, denominations, instances, liaisons, deputations, interlinkages, regions, syndicats, Congresses, conglomerates, aggregations, professionals, networks, correlations, centres, activists, professions, relationship, organisers, agglomerations, organizes, battlegroups, commitments, departments, gatherings, initiatives, inter-linkages, formations, representatives, Regulations, Branches, applications, Movements, trusts, Categories, Administrators, collectives, interests, Constituencies, CSOS, practitioners, boards, Christians, names, Forums, teams, CBOS, sectors, panels, brotherhoods, dealings, contexts, cartels, mutuals, contributors, rings, ventures, businessmen, joints, moves, assemblages, governmental, co-ops, arrangements, effects, candidates, Populations, physics, correlates, advocates, components, applicants, Businesses, affiliates, proceedings, Facilities, memberships, Sports, clubhouses, Labeling, units, chambers, partners, artists, NSAS, troupes, affairs, Migrants, toronto, differences, Firms, orders, circles, Physicians, Investments, immigrants, Patches, Plants, Operators, works, Attorneys, joins, Exigencies, engagements, rooms, grounds, traders, commands, polls, Rights, Houses, bridges, demands, stakeholders, Resources, blocs, complexes, physical, laws, regulators, citizens, allies, bonds, managers, false, overtones, mergers, structures, providers, customers, reports, Rallies, bands, settlements, Ones, disputes, funds, periodic, requirements, Tissues, Parents, Undertakings, levels, platforms, issues, airlines, packages, farmers, foreigners, sets, churches, Elles, exports, members, kinds, Parties, liens, Languages, Clients, Cameras, Couples, aliens, compounds, Marriages, Countries, aggregates, actors, workers, -rrb-, would, bundles, women, players, doctors, bedrooms, flows, Activities, Territories, heads, crowds, Charities, authorities, organs, organisms, Ideas, ties, combinations, corporations, Foundations. relations, Fellowships, Governments, Lawyers, partnership, partnerships. I came straight to Florence - I was eager to see it again, on account of associations. It is full of associations to me. actin, agitation, acetone, ascidian, astheny, actinon, academy, accustom, act on, aquitaine, Acetin, acquisition, augustinian, austen, azactam, asthenia, actinia, academia, astana, azotemia, academe, augustine, akkadian, asthma, auction, accusation, astatine, actuation, azotaemia, austin, augustan, actinian, acetonemia, ashton, action, aquitania, acadian, access time, acidemia, actium, acetum, actinium.